This page is an introduction to our approach to Western Alchemy as an imaginative art, and a way of psychic inquiry, within psychotherapy. Our approach is influenced by our backgrounds in Gestalt. Much has been hypothesised about the meanings of these rich, mysterious works, many created during the Middle Ages (although Alchemy itself is a much older tradition). We don’t presume to understand what the motives were of the makers of these works. It’s easy to find a range of commentaries on Alchemical works, both in published books and online. While some commentators see Alchemy merely as a precursor to modern chemistry and “real” science, others (like Jung and the post-Jungians) see it as a portal to unconscious, archetypal processes. We take an imaginative approach that is accord with Gestalt’s phenomenological stance. We like to ask: what does this Alchemical work or series of works mean for us in the Here-and-Now? Where are we nourished by a work, where enriched in some way? For us, this is the test of the work as a (usually visual) device: does it work in some direct way, upon our emotions and our sense of ourselves. The originators of Gestalt were interested in Aristotle’s biological and process-oriented thinking. Rather than residing in (Plato’s) ideal forms, Aristotle understood being as action, as the ability to have effects. Aristotle was anti-materialist, in a way that offered the early Gestalt thinkers a way out of the dead end of the Cartesian split between mind and matter. Hence came Gestalt’s ideas of fields of influence and relationship (rather than a focus on individual bodies), ideas that are becoming increasingly the subject of contemporary science (complex systems of actions). Medieval Alchemy was interested in Aristotle’s descriptions of the four elements, and took these into its work, but more than this, took his (by then marginalised) holistic view of mind and matter as well – both matter and mind were animated (anima). The Alchemists can be thought of as performing actions on elements (both psychic and material), actions that enable these elements to change. The word emotion comes from the Latin emovere, from e- (variant of ex- ) “out” + movere “move”. So, as contemporary psychotherapy is understanding more and more, our emotions are moving energies, and blocks to their movement are unhealthy. 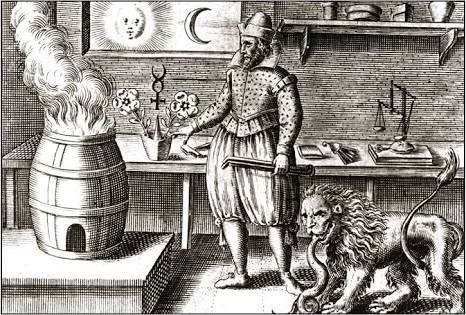 Alchemical images are examples of visual devices we can use as a means of staying in contact with emotions. The word temper comes from the Old English temprian, to “bring something into the required condition by mixing it with something else”. Alchemy says a lot about processes and mixing, and we can imagine how by the right mixing of emotions we might be able to better “temper” ourselves, to be better able to hold a suitable temper against the onslaughts of a complex, chaotic world. From this standpoint we welcome your enjoyment of the works we will reflect upon here, as we gradually build a small resource on Western Medieval Alchemy from a Gestalt perspective. Please check back sometime! These reflections on The Book of Lambspring mark the beginning of our Alchemy resources. The book is a series of 15 figures and accompanying texts, from the 17th century. It’s a powerful reflection on inner work and on the uniting of polarities.